Five theologians will discuss the life and work of Blessed Óscar Romero of El Salvador in a presentation titled “Archbishop Romero and Spiritual Leadership in the Modern World” at 4 p.m. Sept. 17 (Thursday) in the Hesburgh Center for International Studies Auditorium. The panel of theologians will include Rev. Robert S. Pelton, C.S.C., director emeritus of Notre Dame’s Latin American/North American Church Concerns (LANACC); Margaret Pfeil, associate professional specialist in theology; Rev. Michael E. Connors, C.S.C., director of the Marten Program in Homiletics and Liturgies; Thomas Kelly, professor of theology at Creighton University; and Rev. Gustavo Gutierrez, O.P., John Cardinal O’Hara Professor of Theology at Notre Dame. All of them are contributors to a new book on Blessed Oscar Romero that will be launched during the discussion. 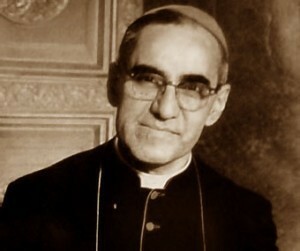 Archbishop Romero of San Salvador was assassinated by a right-wing death squad while presiding at Mass in the chapel of the Hospital of Divine Providence on March 24, 1980. His outspoken advocacy of human rights, his denunciations of U.S. military aid to El Salvador and his insistence that the Church be inseparable from the poor all made him a figure of some controversy before and after his death. Already widely venerated as a martyr throughout Latin America and in this country, he was declared a martyr by Pope Francis and beatified, the last step before official canonization as a saint in the Catholic Church, on May 23, 2015. The event, sponsored by the Kellogg Institute for International Studies, an integral part of the Keough School for Global Affairs, is free and open to the public. It will be followed by a reception and booksigning.